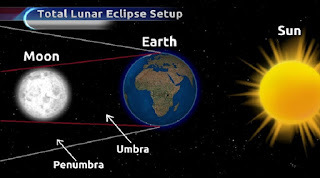 The Hindu scriptures, the Purãnam (written by Veda Vyasar), narrate the story of how the eclipse came into existence: Eclipses have fascinated man since time immemorial, but the real scientific cause was known to Siddhas, Yogis, Rishis and Saddhus, even during ancient times. In order to make matters clear to young children, they used to tell the story of how Rahu, the dragon would swallow up the Moon or Sun during eclipse time and release them after some time. The story goes that Rahu sat for a feast disguised as a Deva (though he was an Asura), when Lord Vishnu in His Mohini Avatar distributed nectar to the Devas which was obtained at the time of churning of the Milky Ocean. Lord Surya-Sun along Lord Chandra-Moon exposed the designs of Rahu and hence, the story goes, Rahu chooses to punish the luminaries for this, as an act of revenge. In India, all scientific truths are imbibed in our routine life, by explaining then through Puranic stories. Through tradition or custom, all scientific truths are brought to the stage of implementation in day to day life. Therein lies the wisdom of our great Siddhas, Yogis, Rishis and Saddhus. Persuing spiritual activities, especially doing Japa of mantras, is recommended during the eclipse period. 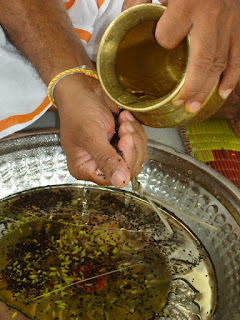 In order to overcome adverse effects of eclipses, one should bathe in holy waters, offering tarpanam to departed ancestors and do some charities.Those who are running the major or sub periods of Rahu or Ketu should chant Rahu mantra, Nagaraja mantra or Goddess Durga mantra (Hmmm Dum Durgaya Namaha) to get rid of the afflictions.Those facing hurdles in marriage or carrier also should take to worship during eclipse at home (generally temples will be closed during eclipse). After the eclipse is over, take bath again and eat the food, which is prepared fresh after the eclipse. The most recommended ritual to be done on this day is Tarpanam, the ritual to appease the souls of your ancestors. The gateway to heaven is the Sun and Moon. During eclipse, the gates open and the souls visit the earth plane making it the right time to access their blessings and divine energy. 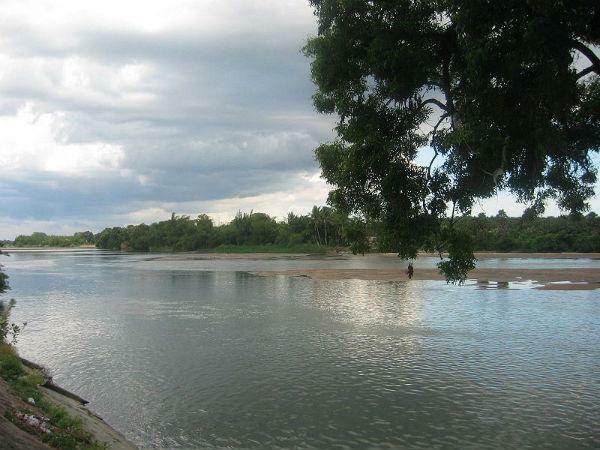 It is believed that during an eclipse all the water becomes as pure as the water of the holy river Ganga. Any surging water (say, waterfall or a fountain) or water in the lakes, river and the seas is regarded as a good omen, its auspiciousness increasing in the above sequence. The more pious may go to some sacred place or to the nearest seashore for taking a holy bath. 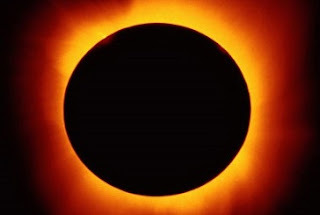 There is a strong belief that any donation given during the eclipse hours is most auspicious and valuables such as money, clothes, cows, horses, land and gold are to be gifted away. All Hindu Temples remain closed during Surya Grahanam. Temples open only after proper rituals are performed to get rid of the ill effects of the Surya Grahanam. 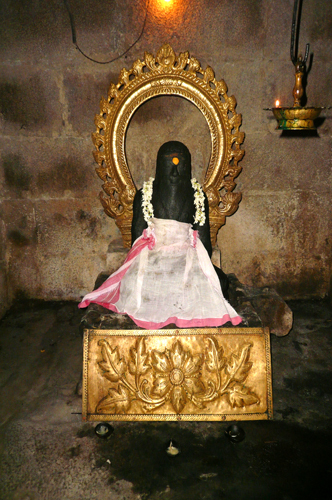 However, some Lord Shiva temples remain open during Surya Grahanam as Lord Shiva Himself is an embodiment of darkness. Why mantras should be chanted during eclipse times? During eclipse, the sound vibrations get intensified. As a result, the person who recites a mantra gets manifold benefits than while it on a normal day. There is a second version to this also. 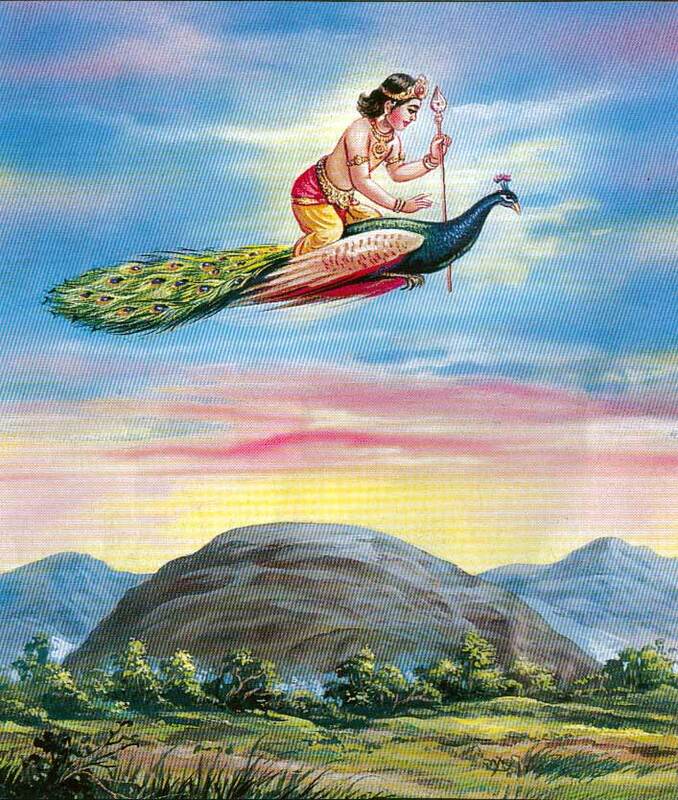 When there is an eclipse, both the Sun and Moon are afflicted by Rahu or Ketu. So a person's mind will not function well. If he takes a decision at that time, it will prove wrong, because mind is affected at that time. To prevent him from working at that time, the mind should be diverted to something else. So it is ordained that some spiritual karma like chanting of mantras should be done, at the time of eclipse. Aditya Hridayam, Gayatri Mantra or Vishnu Gayathri mantra are also gives beneficial effects when chanted at the time of eclipse. 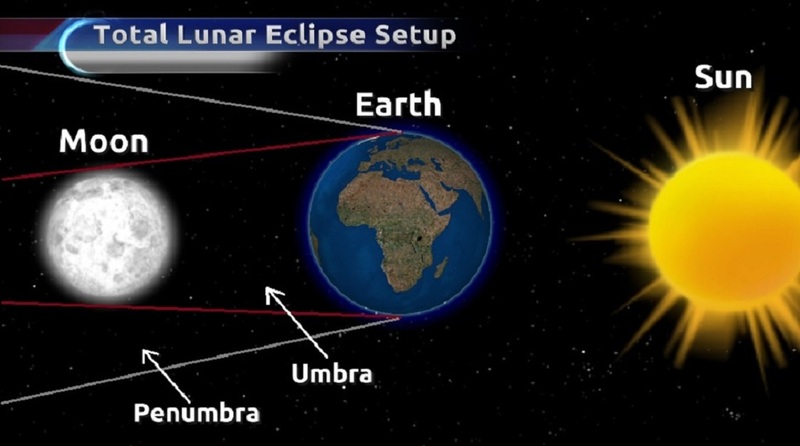 It is also said food items get contaminated, when the rays emanating during the time of eclipse pervade the atmosphere. Herein lies the utility and value of Darbha grass. Darbha / Kusha grass grows freely in hot and dry places. It is said that if we put a single Darbha grass on food items, that enough to protect it harmful efforts of eclipse. Darbha grass is also used in many religious functions. It has even been proved scientifically that even X-ray radiation can be absorbed by Darbha grass. This grass should be freely used to protect foodstuffs during times of eclipse. 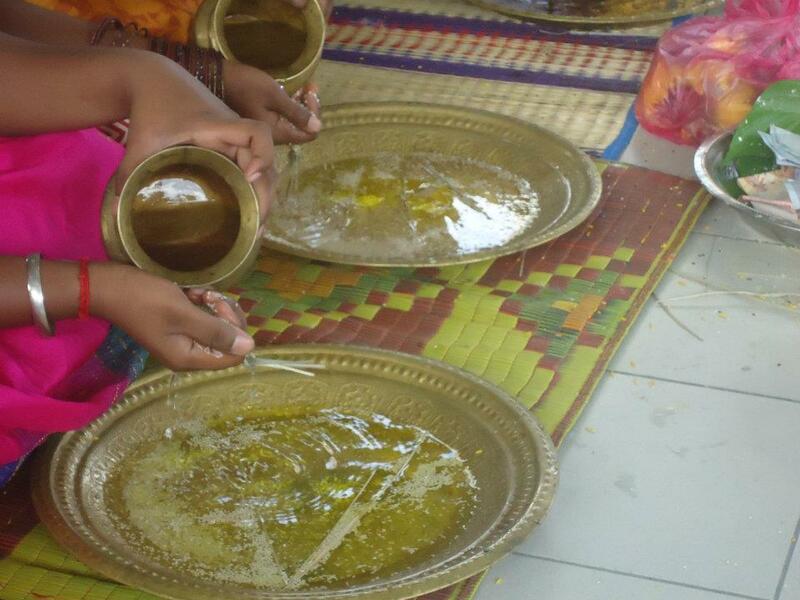 Lighting of Lemon Ghee lamps during the eclipse time will also be very useful in weakening the negative effects of Rahu. Those belonging to Jyesta (Kettai) & Moola stars should avoid looking/getting exposed to the Eclipse. Specific prayers to Goddess Durga (for Rahu), Lord Sri Krishna and Lord Shiva (For Moon), Lord Hanuman, Moon God are required to be made during eclipse. For those under the constellation of Moola whose star lord is Ketu it is suggested to pray Lord Ganapathi also during eclipse time. The Sanskrit term 'Shakti' means 'power'. There is a supreme power behind this universe that is expressed in many varied ways. Heat, light, lightning - all these are expressions of just that power. Shakti is the creator of the universe. The universe is her form. She is the foundation of the world and forms of the body. Shakti is the form of all things that live and move in the world. Goddess energy or Shakti is the ever present dynamic force which activates this world. It is immanent in every being and the Universe. Goddesses are revered and celebrated so that they bless us with both material and spiritual abundance. Not many people have the grace to perform true Shakti worship. The month Adi is special for Goddess worships since in this month , the Sun will be in the sign Kadakam which is ruling by planet Moon (Moon is belongs to Goddess). 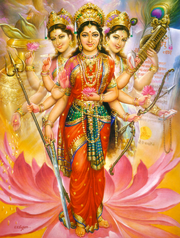 Shakti has manifested in various forms like Durga, Kali, Lakshmi, Saraswati and so on. Shakti represents 3 potencies and they are Itcha Shakti, Kriya Shakti and Jnana Shakti. 1. Itcha Shakti is the will power, the desire or motivation which relates to the Mind. These 3 powers esoterically manifest in yourself as follows. There is the one you think you are (physical body), the one others think you are (mind) and the one you really are (principle of the soul or 'atma'). Everyone is essentially divine, but is unable to understand this by the very nature of being human. 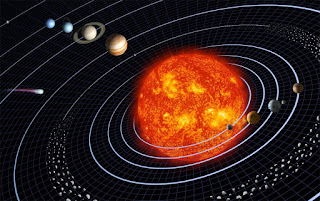 Every year during Adi month (Mid July to Mid August) period the Sun moves towards the South and hence it is called the Dhakshinayana (Dhakshin: South; ayana: Travel). 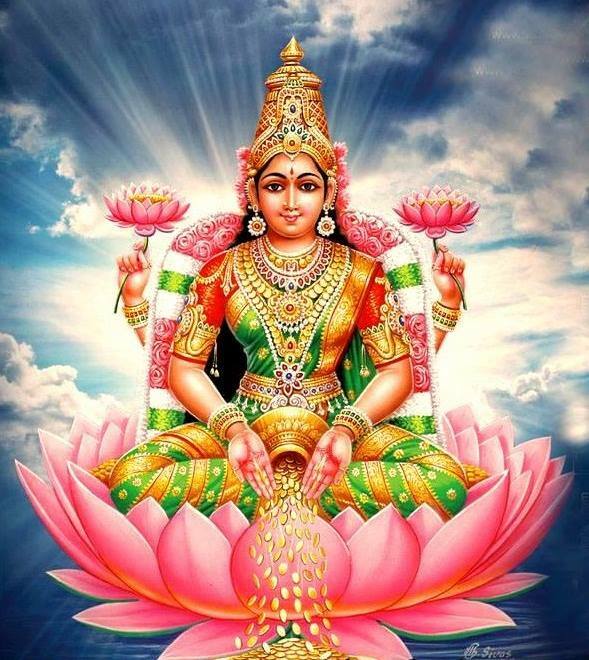 The Tamil month of Adi (Mid July to Mid August) has a great significance for Shakti worship especially the Fridays that falls during this month. 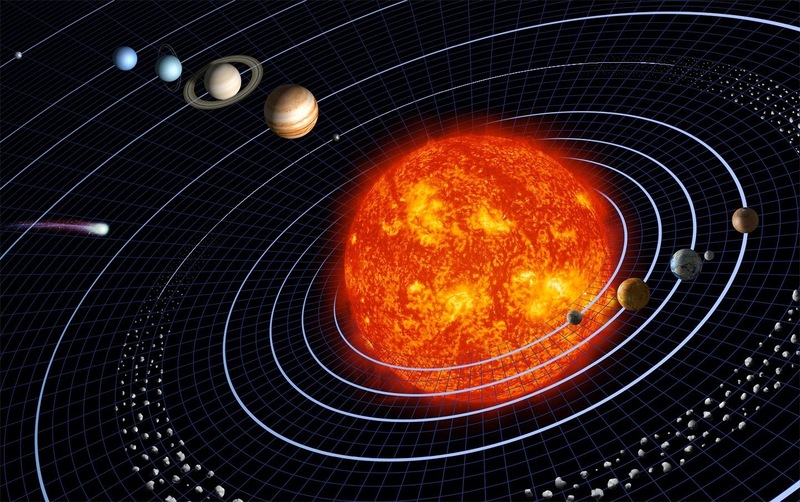 In this month the Sun Changes the direction of his chariot from north to south and the entire six months from Adi month is basically considered inauspicious since Sun moves towards debilitation. Hence starting from Adi month, it became a practice to indulge in increased religious practices to propitiate the deities, since the positive energy that is received fron Sun is lessening gradually. The Fridays of Adi month are very auspicious for establishing your connection with the Goddess. The Siddhas brought the Goddess over to the earth plane to certain energy spots and enshrined them through esoteric processes. The Goddess stays in the form of a rock or statue that retains Her energy. It is important to visit those shrines and 'bond' with this creative Shakti energy. How to invoke Goddesses energy that residing within you especially during Aadi month through mantras for true knowledge, health, material wealth and spiritual evolution? 4.Focus on your crown head and recite 'Hreem' for 1 minute to invoke Goddess Durga for spiritual power. Sound is only an expression of energy - shakti. By invoking these sounds with pure bhakti and your Guru's blessings, the Goddess will be attracted towards you to give Her immeasurable blessings. 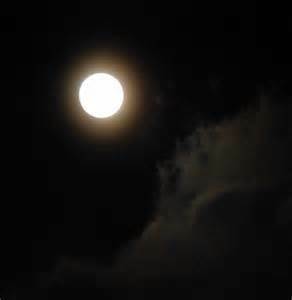 What is Full Moon & Guru Purnima (Full Moon of the Guru) ? The Moon is the sensorial, transmitter and collector of other planetary influences.The phases of the Moon affects our mind and emotions. What happens during full moon ? You can do this yourself by buying the homam ingredients, where you can be easily buy in Indian shop which will cost around RM 10 a box and conducting a simple fire ritual by burning it inside a clay pot. 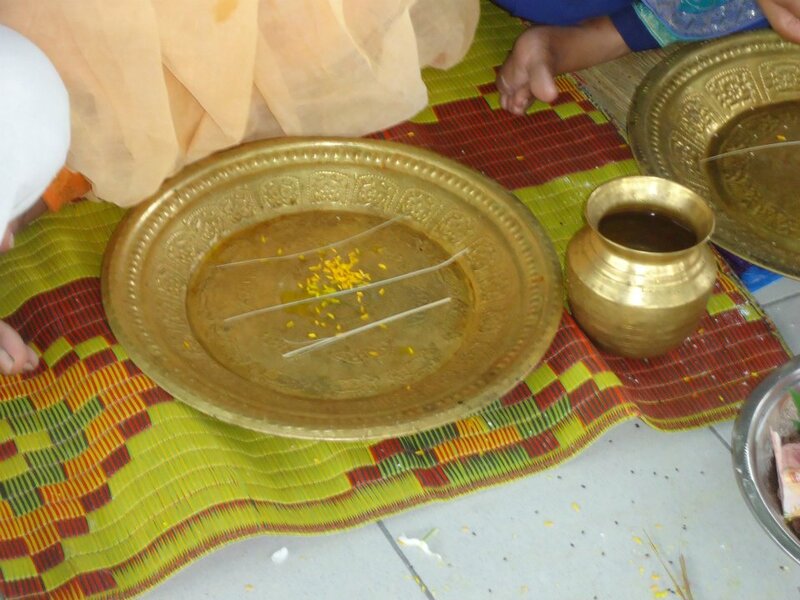 Doing this ritual once every month on the eve or the morning of Pournami (Full Moon) would rid off any negative energy that is accumulated in the house and charge your house with Nithya Deivathai shakti - energies from the Full Moon for greater prosperity. What is Guru Purnima ? Guru is the person who dispels darkness. Guru can be split into two root words - Gu and Ru. Gu means darkness and Ru is light. The darkness here refers to the lack of clarity in the mind owing to muddled thinking patterns that have formed grooves in the psyche. These thought grooves do not allow a person to progress in life. They are highly limiting in nature and this does not allow an individual to know his true nature, which is a limitless consciousness. A guru is a person who functions like a master sculptor, chiselling a big piece of rock, which is the disciple. He sees the idol in the rock and chips out all the unwanted bits and pieces. What remains is a fine ideal of a personality that was hidden within the maze of confusing thoughts. The Saptarishi or the Seven Great Sages (Atri, Bhrigu, Pulastya, Vasistya, Gautama, Angirasa and Marichi) are the primeval teachers who continue to guide humanity to the secrets of life and universe. They are known as 'seers' as they are said to possess perfect knowledge about the past, present and future of humanity. On Guru Purnima, grace from these Masters is easily accessible to all those who think of them. Guru Purnima is one of the most auspicious days in the Hindu calender. It is the day when the Guru principle frequencies are 1000 time more active on earth. It is a celebration of the Guru disciple lineage and also a day for the disciple to express his gratitude to the Guru for his spiritual upliftment. The Guru is considered an embodiment of the archetypes Brahma, Vishnu and Shiva. As per a Vedic saying, Guru's form is the basis of meditation, Guru's feet are the basis of worship, Guru's words are the basis of mantra (sacred sound), and Guru's grace is the basis of enlightenment. On this most important day, meditate on the lotus feet of your Guru. Mentally pray to him for his grace,through which alone can attain Self-realization. If you do not have Guru then pray to Lord Dakshnamurthi or Lord Krishna to purify your heart for arrival of your Guru in this life. You may study the books or writings of your Guru, or mentally reflect upon his teachings. The best form of worship of the Guru is to follow his teachings, to shine as the very embodiment of his teachings, and to propagate his glory and his message. Every human being in this world lead life only in search of Guru knowingly or unknowingly. That means any human life in this world is the most certified path towards his Spiritual master only. Hence human life is declared as the most precious one as this only helps attain your Spiritual Master and then God too. If one does not come across his Guru, what happens then? Then the search for Guru will continues in many lives. So the real meaning of human birth itself is continuation of search (Guru). Meaning: Guru is verily the representative of Brahma, Vishnu and Shiva. He creates, sustains knowledge and destroys the weeds of ignorance. I salute such a Guru. "Dhyaanamoolam Gurur Moorthihi Poojamoolam Guroh Padam Mantramoolam Guror Vaakyam Moksha Moolam Guru Krupa"
Meaning: The Guru's form is the best to meditate upon; the Guru's feet are the best for worship; the Guru's word is the mantra; the Guru's Grace is the root of liberation.